Starting with 12c, there is a new exciting feature. Oracle Flex ASM enables an Oracle ASM instance to run on a separate physical server from the database servers. Since UNDO appeared as substitute of Rollback Segment this kind of error has greatly reduced. Researching the subject, there is a note from Siebel ID 477025.1, You can it in My Oracle Support (formerly known as Metalink) detailing the error. The solution has been disable UNDO (setting it to manual) and create a large Rollback Segment. Now available in beta, the 1Z1-060 exam, this gives access to 12c from OCP 9i, 10g or 11g. More information is available here. If you do not own the OCP, you must first get 12c OCA certification. In this case it is necessary to pass 1Z0-061, 1Z0-062 and 1Z0-063 exams. Starting with Siebel Fix Pack 8.1.1.1 and later, SQL tagging feature provides the ability to trace the origin of long-running or slow-performing SQL statements. After SQL tagging is enabled (from Siebel), tagging information is added to the Siebel Application Object Manager. This feature is only available for SELECT. Other statements such as INSERT, UPDATE, DELETE or MERGE are not tagged. componentname is the alias of the component. servername is the name of the Siebel Server on which the component or task is running. taskid is the task ID of the user who generated the query. userid is the login name of the user who generated the query. flowid is the flow ID of the component or task. sarmid is the SARM ID of the component or task. busobjname is the business object name. buscompname is the business component name. viewname is the view name. 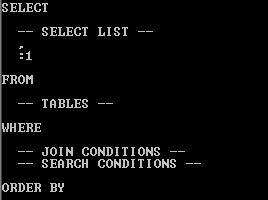 The tagged sql is returned as bind variable inside the <select list>, in the nth position, before the FROM clause. It will the bind variable label as :1, the rest of the statement will as usual. FROM clause, WHERE clause and ORDER (if exist). Note that the SQLID in Oracle SQL Tagging sentence will be different from a sentence without SQL Tagging. Today I had a problem with a private database link between two databases. The user reports that running a simple “desc dual@pluto.cartoons.com” doesn’t work. Currently in the source database are three sessions hung. If we look at that do these sessions, we can see that are waiting for the event single-task message. This event usually occurs across the database link connection. We tried to perform a tnsping to check the listener. Tnsping command doesn’t reply, so we can determine that the problem is the listener, try perform a lsnrctl status but not responding so we opted to finish the process with the command “kill -9” since we are on unix platform and restart the listener. In the source database the first three sessiones continue unanswered so we kill, in this case from database. The kill command reply “ORA-00031: session marked for kill”. The sessions continue but do not die, so we kill them using kill command from Operating System . Get IP-Address in RAC interconnect from Oracle Instance. Sometimes we have no access to the clusterware and we need to verify or find out the IP of the NIC interconnect. 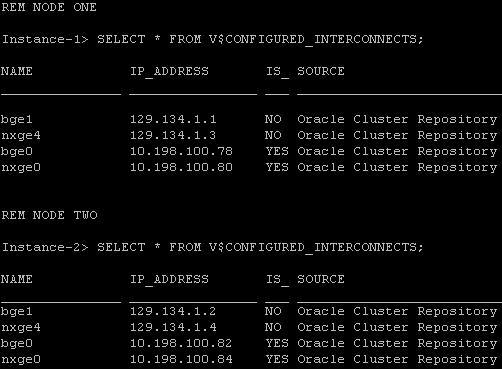 We can get this information in a simple way because Oracle provides two Oracle views, V$CLUSTER_INTERCONNECTS and V$CONFIGURED_INTERCONNECTS. V$CONFIGURED_INTERCONNECTS displays all the interconnects that Oracle is aware of and where Oracle found the information about a specific interconnect. This view have four attributes. We connect to all the nodes that make up the cluster and execute the following statement . (In this case there are only two nodes). In this case there is only one instance so we will only get the NIC configured where the instance is running.